In oxyfuel cutting, oxygen is used as the cutting gas. Cutting is initiated by heating the edge of the steel to the ignition temperature, and then torch blows extra oxygen at higher pressures into the workpiece. The chemical reaction releases large amounts of energy causing the metal to burn and blowing the resulting molten oxide through to the other side. The oxygen chemically combines with the iron in the ferrous material to instantly oxidize the iron into molten iron oxide, producing the cut. Initiating a cut in the middle of a workpiece is known as piercing. Oxy-fuel cutting and welding are related technologies that differ mainly by achieved temperatures. 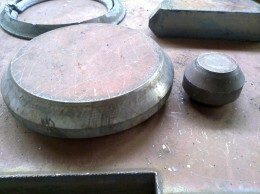 Whereas the aim of welding is to slightly melt the welded sections so that after cooling they combine to create a single piece; in cutting, the material is heated to the ignition temperature.Iron-containing metals burns to iron oxides that are blown out of the incision site in the form of molten slag. In both processes, a combination of pure oxygen and combustible fuel gas (such as acetylene, propane, or, less often, natural gas) is used.Oxygen enables the flame to achieve higher a temperature compared with ordinary air. While an air-propane flame burns at a temperature of about 2 000 °C, it is up to 2 500 °C in combination with oxygen.Oxyacetylene flame can even achieve 3 500 °C.Chemically, it is an exothermic oxidation of the fuel gas. Simply said, combination of oxygen with fuel particles produces molecules with lower energy amounts than separate oxygen and fuel molecules had.The excess energy is released as heat that enables burning of the cut metal. This burning is also an exothermic oxidation - a combination of molecules of oxygen and iron to form iron oxides while releasing heat.This makes it possible to cut the material significantly faster than if it was just melted through. The torch has two types of nozzles at the end: a central nozzle for compressed oxygen, and preheating nozzles distributed around the former. Through those flows a mixture of oxygen and fuel gas that burns and heats the cut material to the ignition temperature.When that is achieved, oxygen starts to flow from the central nozzle at a pressure that supports burning of the metal while blowing debris out of the cutting gap. When positioning the object to be cut it is necessary to see to it that there is free space i the direction of the oxygen flow for removing the debris.The pressure oxygen pipes are separate from the pipes used for oxygen for preheating flame. With this technology, material up to a thickness of one meter can be cut` even more when using special torches.Heat-affected area is large and the cut surface is rough. Its most significant advantage is its relatively low cost and availability of supplies. However, it is very energetically intensive.With oxy-fuel, we can cut steels except stainless, it is also not applicable for cutting aluminum and its alloys.